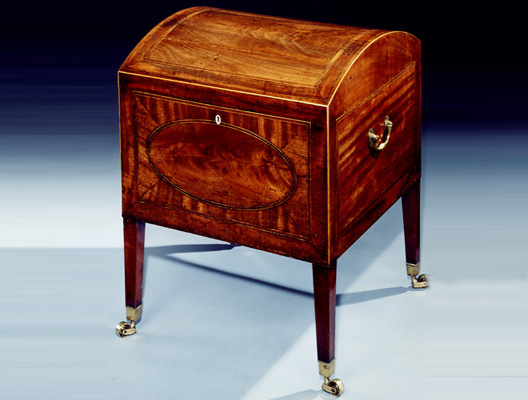 A very fine quality English George III period gardevin or cellaret, being executed in the finest mahogany, the trunk top being crossbanded and inlaid with purplewood banding and boxwood stringing, the front being centred by an oval panel of ‘flame- figured’ mahogany, the surrounding veneer being laid on the ‘quarter’ cut, and being similarly inlaid with purplewood banding and boxwood stringing, the sides AND the back being veneered in choice mahogany veneers with purplewood inlay and boxwood stringing, the sides still retaining the original brass carrying handles, the whole supported on square tapering legs terminating in the original brass box castors; the trunk top opening to reveal nine mahogany and mahogany moulded circular receptacles, each made to hold a magnum wine bottle, the gardevin stamped ‘GILLOWS. LANCASTER’. The original drawing for the gardevin (number 4351) taken from the Gillow records and dated 1787 is illustrated in Gillow Furniture Designs 1760-1800 edited by Lindsay Boynton, plate 183. 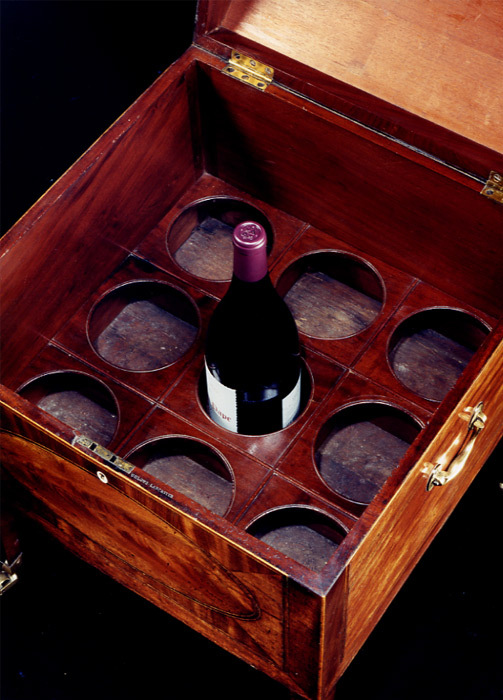 This design was executed between May and June 1787 and was made to hold nine bottles. This was founded in Lancaster by Robert Gillow the elder in about 1730. The port of Lancaster was just beginning to flourish with an increase in trade between England and the Caribbean islands, Jamaica and Barbados in particular. With the imports of cotton, sugar, rum, and in particular for Gillow, timber, from these outposts, the company gradually built up a very substantial export business in its wares with this part of the world. 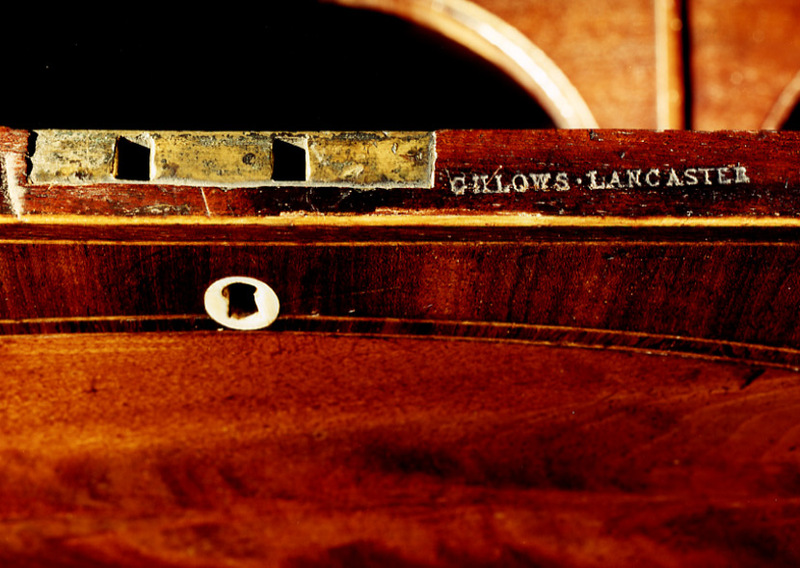 Further, since the family were staunchly Catholic, the Gillows numbered amongst its clients some of the most important Catholic families in the North West such as the Cliffords of Tixall, the Constables of Terregles House, the Fitzherbert-Brockholeses of Claughton Hall, the Tempests of Broughton Hall and the Blundells of Ince. Their patronage stretched much further afield and included the Cliffords of Chudleigh and Lord Arundell of Wardour. 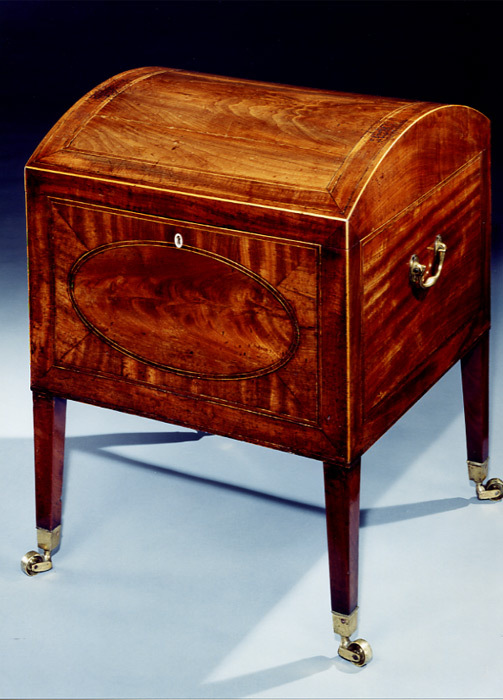 In 1769, a London branch was opened by Thomas Gillow and William Taylor (who had trained as a cabinet maker in Lancaster). Overall height 27in (68.5cm). Width 19 3/4in (50cm). Depth 19 3/4in (50cm).